"To 'move on' without justice is simply not possible for the thousands, even millions, of victims of the Marcos dictatorship. Instead, it is the Marcoses who should move on,” said Danilo Dela Fuente, spokesperson of SELDA, today during the Supreme Court oral arguments on the petitions against late dictator Ferdinand Marcos’ burial at the Libingan ng mga Bayani. Former political prisoners and torture survivors during martial law, including dela Fuente and other personalities, were the first batch of those who filed the petition. Hands off teachers in Lumad community schools! “The illegal arrests, threats and harassment of teachers in Lumad community schools prove that Oplan Bayanihan continues against Lumad communities and the people who support their struggle,” Cristina Palabay, Karapatan secretary general, said. Pres. Rodrigo Duterte has repeatedly stated that one of the biggest problems in Philippine society is the proliferation of illegal drugs and the evils that come with it. The heinousness of crimes brought about by drug addiction is undeniable - the rapes and murders of women and young girls, even babies and mothers, the butchered bodies, and all else inhuman. While it is true, that this problem should be cut to the core, the solution is not as easy as one would exterminate termites. Karapatan welcomed the resumption of formal peace talks between the Philippine government and the National Democratic Front of the Philippines (NDFP) today, August 22, 2016, as "an important occasion in the struggle for just and lasting peace in the Philippines." Karapatan welcomes the release of thirteen political prisoners. It is optimistic that recently released consultants of the National Democratic Front of the Philippines will have a meaningful and substantial participation to the resumption of the formal NDFP-GRP peacetalks. BREAKING NEWS: NDFP consultant Adelberto Silva was released this afternoon from MMDJ-SICA 1. While we welcome Silva's release, we are concerned over PNP Custodial Center Warden Arnel Apud's callousness in facilitating the release of NDFP consultants Benito and Wilma Tiamzon, despite the issuance of release orders for them in the four local courts. Release Benito and Wilma Tiamzon now! Release all detained NDFP consultants now! Release all political prisoners! Release of four more detained NDF peace consultants improves climate for the peace talks! We, National Democratic Front of the Philippines (NDF) peace consultants, who are being released today, and others expecting to be released the next few days, in time for the resumption of formal peace talks with the present Government of the Republic of the Philippines (GRP) and, in the spirit of overcoming a long-standing main barrier to the peace talks, appreciate that the matter of the questionable, if not dubious, arrest and detention of NDF peace consultants by previous regimes is now being rectified by the new Duterte regime. 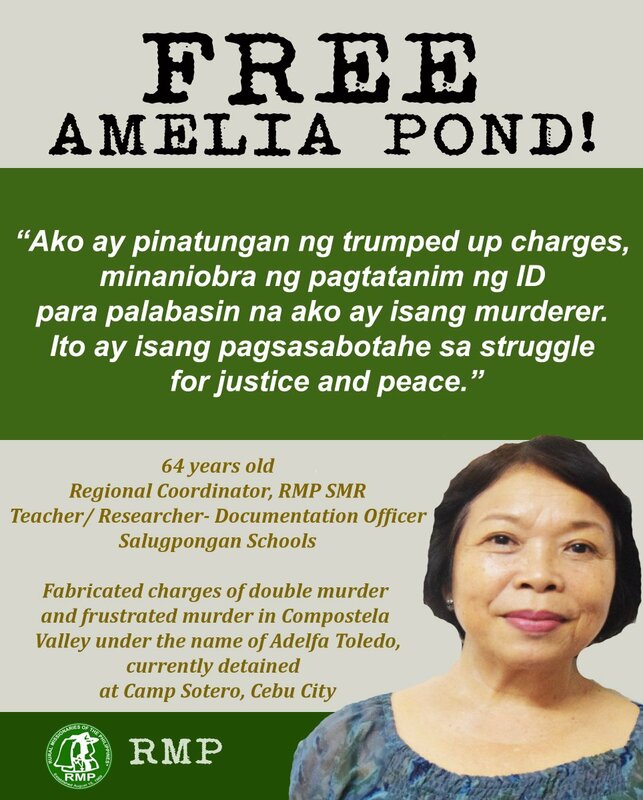 We appreciate, too, the higher ups' immediate and direct intervention to overcome petty bureaucratic hitches that have delayed, at the implementation level of some courts and local jail authorities, the release of a number of detained NDF peace consultants. We see such interventions as indications of the new Duterte regime's real interest that the resumption of the NDF-GRP peace and talks would immediately be pulled through, and that barriers to such would be overcome. Most local courts have already issued favorable orders granting the parallel motions for release on bail for nineteen (18) detained peace consultants of the National Democratic Front of the Philippines and protected persons under the Joint Agreement on Safety and Immunity Guarantees (JASIG) and two political prisoners for humanitarian release. The urgent motions were filed through defense counsels of the political prisoners, after the Supreme Court resolution on the release of those who will participate in the opening of the formal peacetalks between the NDFP and Philippines government this August 20-27, 2016 in Oslo, Norway. Martial Law victims led by former political detainees and people’s organizations filed a petition at the Supreme Court Monday, August 15, for Certiorari and Prohibition with Application for a Temporary Restraining Order (TRO) and/or Writ of Preliminary Injunction to disallow the burial of the deposed dictator Ferdinand E. Marcos at the Libingan ng mga Bayani (LNMB). Cenon Sambola, a 60-year old elderly and sickly detainee, has been a political prisoner for more than a year now, as a replacement for his son, Jerson. You read it right – as a replacement. Soldiers shot dead a woman farmer in Monkayao on Monday, as human rights violations escalate in military operations by the Philippine Army's 10th Infantry Division in various communities in Compostela Valley. Reports from Karapatan-Southern Mindanao said that last August 7, 19-year old Rose Em Sayson was shot by soldiers who mistaken her and her companions as members of the New People's Army. Free NDFP peace consultant Tirso “Ka Bart” Alcantara! Tirso Alcantara, 62 years old, is better known as the legendary New People's Army (NPA) commander "Ka Bart." He is one of the 22 National Democratic Front of the Philippines (NDFP) peace consultants, who has been detained since his arrest in early 2011. Even before his arrest, foul fascist acts had been viciously waged against his family. It is lamentable that the Supreme Court did not grant the motion for temporary release of the eight (8) detained peace consultants of the NDFP and two political prisoners for humanitarian release to directly facilitate their release. We also take exception to the limitations set by the SC order on the participation of NDFP consultants Vicente Ladlad and Randall Echanis. We, however, welcome the SC’s emphasis on the need for the local courts to give “appropriate priority” to hearings of motions for the releases of the 10 political prisoners. "We dare the Duterte government to arrest paramilitary butchers Alde ‘Butsoy’ Salusad and his father, Benjamin and serve their warrant. In fact, all the named perpetrators in the killings of Lumad and peasant activists should immediately be arrested," Karapatan and other progressive organizations called today on the AFP’s continuing attacks against civilians through Oplan Bayanihan. Relatives of detained peace consultants: What’s taking the GPH so long? “Our loved ones should be released on just and humanitarian grounds. What is taking the Duterte administration so long?” relatives of political prisoners said today. Morning of July 30, 2016, a community of Tigwahanon tribe in Sitio Tibuwagan, Barangay Kawayan, San Fernando, Bukidnon was strafed by eleven (11) elements of the 8th Infantry Battalion- Philippine Army (IBPA) and Alde ‘Butsoy’ Salusad, leader of the paramilitary group New Indigenous People’s Army for Reform (NIPAR). The residents were at a wedding when Salusad and his companions indiscriminately fired at them. After the incident, all residents of Sitio Tibugawan and nearby communities were forced to evacuate and sought sanctuary in Brgy. Kawayan. "He is lying." This is what Ebao Sulang, father of slain farmer during the April 1 dispersal in Kidapawan City, North Cotabato, said on military witness Charlie Pasco as he filed a perjury case against Pasco at the Department of Justice (DoJ).